Many celebrities and hip hop artists have removable grills that are adorned with gold, platinum, diamonds, and other gemstones. Kanye West, already notorious for his emotional outbursts, public feuds, and controversial rap lyrics, decided to take the concept of the grill to the next level by having his bottom row of teeth replaced with diamonds. Will this spark a new dental trend? The most commonly performed cosmetic dentistry procedures include teeth whitening and the placement of porcelain veneers. 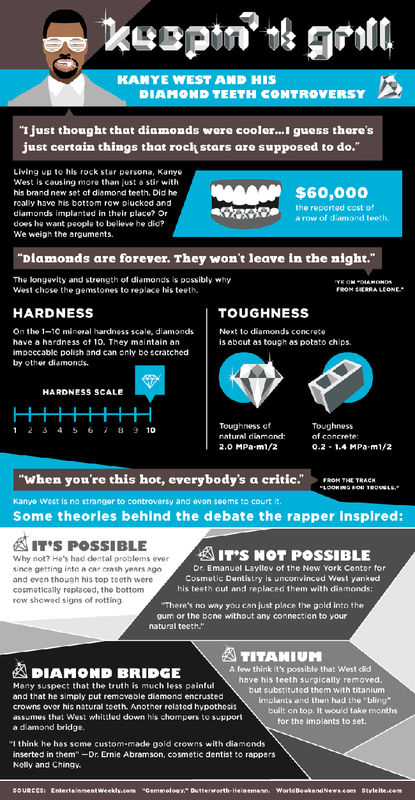 Do you think diamond teeth will ever become as popular as these traditional dental treatments?